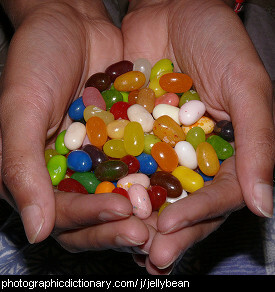 Different kinds of sweets and candy. 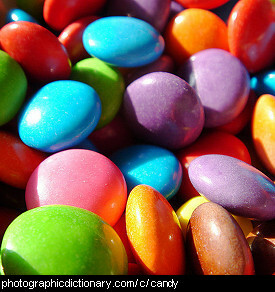 Candy is a generic term for any sweet treats that are made mostly from sugar, often with chocolate added too. Caramel is a word for a mid-brown colour as well as a food. 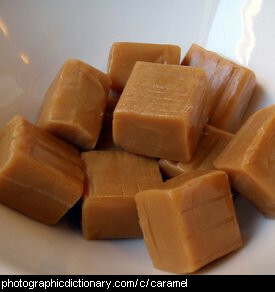 Caramel is made by heating sugar until it melts and changes colour. Caramel has a disctinctive flavour and is used in a lot of desserts like puddings and cakes, and is also used in lots of sweets and candies. 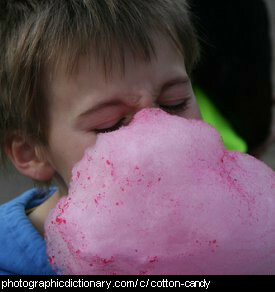 Cotton candy, also called candy floss or fairy floss, is spun sugar. It is usually dyed pink but is naturally white. Cotton candy is made by spinning hot, melted sugar into fine threads, and then gathering the threads onto a stick. It has the texture of soft wool or cotton when it is fresh, but gets rougher as it absorbs moisture from the air. Ice cream is a dessert made from frozen milk or cream. Icecream is usually flavoured with sugar, vanilla, fruit or chocolate. 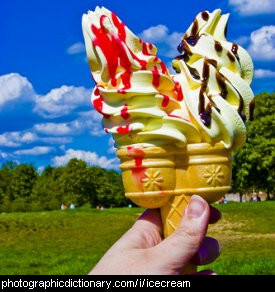 Icecream is made by freezing the milk or cream slowly and stirring it frequently so it stays smooth. If you don't stir it, it will be full of crunchy ice crystals and will not be as nice. Icecream is sometimes served in a cone. 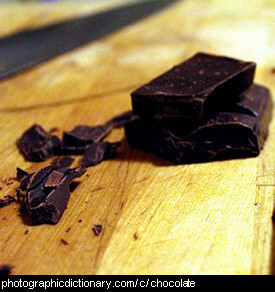 Liquorice, or licorice, is the root of a plant native to southern Europe. In some countries, the root is chewed raw, and in other countries the liquorice flavour is used with sugar to make liquorice candies. 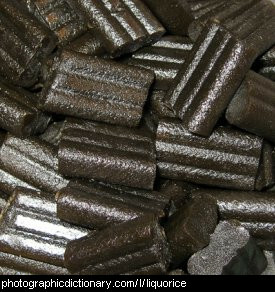 Liquorice has a similar flavour to fennel and anise but is not related to either one of them. Some modern liquorice candies have more anise in them than liquorice. 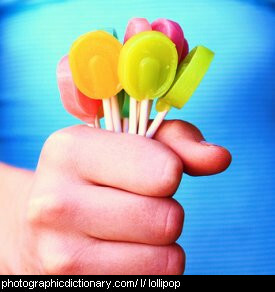 A lollipop or lollypop is a sweet treat on the end of a stick, so you can hold it and lick it without getting your fingers sticky. 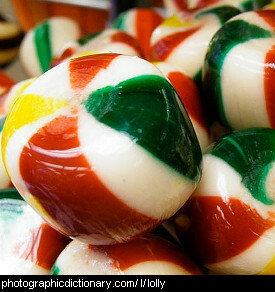 A lolly is another name for candy in some countries. Marshmallows are a type of sweet candy confection that have a spongey texture. They are made mainly from sugar and gelatin. 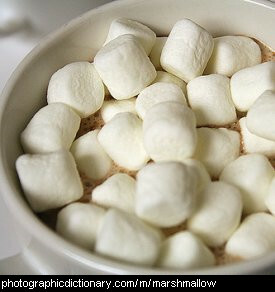 Marshmallows are most often eaten plain, in hot chocolate, or roasted over a fire on a stick and eaten hot.